Defense Minister Liberman says crossing will return to full activity when no more incendiary kites and balloons are launched. Israel will partially reopen the Kerem Shalom crossing between Gaza and Israel later Tuesday, Israeli Defense Minister Avigdor Liberman (Yisrael Beytenu) said. Kerem Shalom was closed July 9 in response to the continued Gaza arson terror, in which incendiary kites and balloons are sent into Israeli territory to burn Israeli farmland, nature reserves, and forests. "Defense Minister Avigdor Liberman decided that Kerem Shalom will partially reopen and as of today at 12:00 p.m. it will be possible to transfer gas and fuel into the Gaza Strip, in addition to food and medicine," Liberman's office said. The statement noted that the number of kites and balloons carrying firebombs into Israeli territory had been reduced but not totally eliminated. It said the crossing could return to full activity soon "conditioned on the full cessation of fire-balloon launches and friction on the fence." Incendiary kites and balloons have sparked hundreds of fires since April, scorching over 30,000 dunams (7413 acres) and caused hundreds of thousands of dollars worth of damage. Incendiary kites have landed in populated areas as well, near kindergartens and homes. 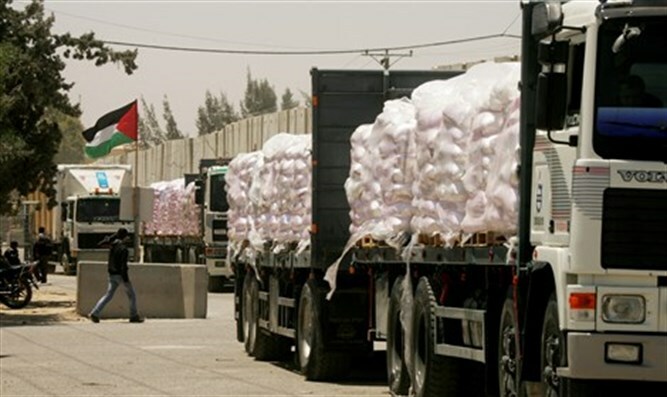 The partial reopening follows a complaint from the United Nations officials that emergency fuel supplies are running low in Gaza. The incendiary kites and balloons are doused in fuel and attached to matches and explosives.